No city has had as powerful and as enduring an impact on Western civilization as London. But what made the city the perfect environment for so many great developments? How did London endure the sweeping historical revolutions and disasters without crumbling? Find the answers to these questions and more in these 24 fascinating lectures. Professor Bucholz takes you through the history of this magnificent metropolis, from its birth as an ancient Roman outpost to its current status as a global village. You'll study the many epic chapters in British and world history - including the English Renaissance, the turmoil of the English civil war, and the epic conflicts of World Wars I and II - through the lens of this amazing capital. What makes the course unique is that it takes you deep into the streets of London during formative periods in its history. Professor Bucholz continuously emphasizes the importance of understanding and experiencing the sights and sounds of London as it was lived by its residents. You'll come to know what daily life was like in historical London, learning the secret histories behind places such as Westminster Abbey, Piccadilly Circus, and London Bridge. This unforgettable look at an unforgettable city will undoubtedly delight and surprise you. By the final lecture, you'll come to realize just what Samuel Johnson meant when he famously declared, "there is in London, all that life can afford." I went to these lectures in order to brush up on my knowledge of London's history (which varies depending on the era from "rather expert" to "rather sketchy") and gain new perspectives on the "Cool Britannia" phenomenon today, and this fit the bill. Robert Bucholz offers an interdisciplinary and broad history of the city drawing from court history, literature, sociology, urban planning, economics, and other approaches. He manages to cover a great deal in a short time, complete with entertaining asides and corny humor. I especially appreciated his guided tours of the city during different stages of its life (Chaucer's time, Shakespeare's time, Samuel Pepys's time, Dickens's time, and "Millennial London"), which provided very useful comparisons and contrasts. A work this brief covering such a time span cannot be all things to all people, but for someone already familiar with the history and wanting a refresher, or someone wholly new to the history and seeking an introduction, this is an ideal resource. 24. Millennial London—How Do You Like It? Enjoyed it a lot but missed the maps etc that are not included with Audable download. Fortunately with a little digging you can find it on the Internet. I have a new Audible routine: every weekday morning before I leave the house, I download the New York Times. If traffic is good, I get there right as the narrators finishing the last section, Opinions. At the end of the day, and now that Great Courses are available, I listen to a 20 to 30 minute lecture; and then I return to whatever book I'm listening to. Well, unless I'm really engaged in the book - I'll put the Great Course lecture aside until I'm done. 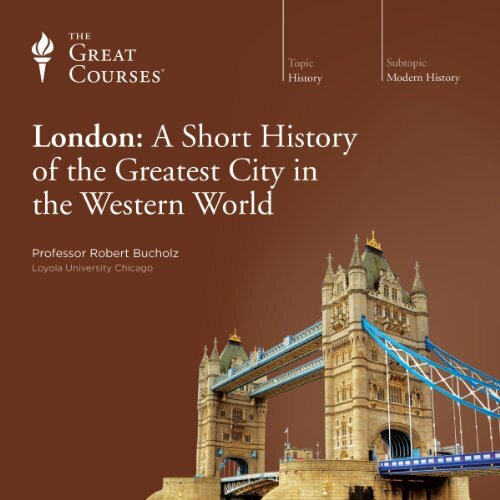 I chose Robert Bucholz' "London: A Short History of the Greatest City in the World" (2009) for my first Great Course. I haven't been to London, but I plan to go soon - and I'd like to know what I will see. I feel like I will. If this were a regular college class, it would be Level 100 - Freshman. Each lecture covers at least 30 years, so it's hard for Bucholz to go into any great detail. The Audible version doesn't come with course materials, which was fine with me - I sure wasn't going to look at them while I was driving. I do wish it had two items, though: maps of London during the eras Bucholz discussed, and a timeline. I enjoyed learning about London, especially from someone who loves it so dearly. Bucholz describes London as though you are there, which was fun to imagine - well, not that The Great Fire and The Blitz were a good time. I liked the way the course was parsed into very manageable segments - I never had to stop listening mid-lecture. Worth the credit, and I hope I get as much out of other Great Courses. The Best King of Travelogue! I loved, loved, loved this audiobook! I've listened to dozens of these courses and none of them struck me as such a labour of love. Dr. Bucholz not only knows his subject, but understands it in a way only a devoted acolyte can. In his able presentation, London turns from a pile of bricks and mortar into a living, breathing entity, with a humanity which includes and yet outstrips its citizenry. In its two millennia (yes, it's that old! ), it has endured and prospered in a spectacular way, but essentially, it's a long story about a place, its corners and backstreets as much as its institutions, where generation after generation have been born, lived their lives and died. We are, all of us, the richer for it's existence. Good Bless London! Long may she endure! This book covers over a millennia of London's history. History buffs in general and English History buffs in particular may be a bit let down in how it speeds along without delving too deeply into any one time period. It begins with the Romans, speeds through the Medieval period, and then it slows down for the Tudors, Stuarts, and Victorians, and World War II. It provides a nice panorama of London's history and of several trends within that history. As somewhat of an English history buff, I wished it had stayed longer on a few periods, but I came away satisfied and with a few new authors, locations, and events to read about. The narration by the teacher is very engaging throughout the lecture. I would recommend this audiobook to people just dipping their toes into English/London history and to history buffs looking for a relaxing romp through the millennia of that city's growth. What made the experience of listening to London: A Short History of the Greatest City in the Western World the most enjoyable? I listened to this course as part of my prep for a vacation to London. It was fantastic. As I walked the streets, visited the sights and sat in the pubs I felt I had a sense of the history and resilience of the place and enjoyed my trip all the more. The personal viewpoints in particular the section on Dr. Johnson. I found myself standing outside his house and then sitting in the Ye Old Cheshire Cheese pub with a appreciation of the man and his times that made the experience memorable. I recommend this course and also reading the extraordinary work, "London: A Biography" by Peter Ackroyd. London came alive to me because of the great work of these two scholars. Where does London: A Short History of the Greatest City in the Western World rank among all the audiobooks you’ve listened to so far? Trying to condense the whole history of a nation in 24 half hour sessions is quite the challenge. Realistically, spending more time on a lesser number of years (say a couple of centuries or so!) would have been better. Essentially, everything is glossed over because of time constraints and you don't take away as much as you could. That said, the presentation is quite good and narrator/professor delivering the lectures does a very good job. While I found this audiobook interesting, I really wouldn't overly recommend it to anyone. What about Professor Robert Bucholz’s performance did you like? What did you love best about London: A Short History of the Greatest City in the Western World? If you are planning to visit London, this lecture plus a good guide book will give overview of the city and how it got to the place it is today. It's hard to tell the history of London and not make it basically the history of England, but while most of the events narrated, from its early founding as a Roman outpost to its modern status as a global financial center, are basically echoes of British history, Professor Bucholz keeps the focus on the city, including periodic "walkabouts" through the ever-changing terrain of London, from Chaucer's time to Churchill's. There will be many kings and queens and wars described, as all of them obviously left a mark on London, and of course there is the Black Death, the Great Fire, Cromwell and Shakespeare, Dickens and Jack the Ripper, the Blitz, the IRA bombings, the London tube bombings, and all those other great events we associate with London. But Bucholz treats London itself, or rather its people, like a character in a long historical epic. There are several points he emphasizes throughout London's history. London has always been somewhat independent of the rest of England. London has historically had its own privileges and prerogatives. It has acted as kingmaker and kingbreaker. Its people have rioted frequently, and London authorities have even recognized "legitimate" riots as the ancient right of its people to express their grievances. London's economy has also often acted independently of the rest of the country. When England is doing poorly, London has often prospered. As in all great cities, London's residents have always been convinced that London is a dangerous city full of violent criminals, going back to at least Chaucer's day, even when the evidence shows that the crime rate was falling, or was no worse in London than anywhere else. As ancient as London is, it seems that very little of its most ancient parts are still intact. Developers right up to the modern day have had few scruples about replacing centuries-old dwellings and edifices with modern buildings. Not many Victorian mansions are still around, let alone streets or buildings going back to medieval times... though you can still find parts of the wall that was once built around the city! This is a lively lecture told with a lot of humor by someone who's clearly a fan of the city. You can listen to this course as a proxy for a brief history of England, but just remember the focus is on the city of London and its occupants. Professor Robert Bucholz held our attention-kept drawing us back for the next lecture. The writing is extraordinary. The tone and cadence of the delivery is first rate. We listened to this for entertainment while visiting London and it enriched our trip. We plan to listen to it again on the plane home. Thank you, Professor Bucholz.